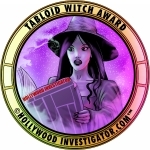 [HollywoodInvestigator.com] Five young women go for a hike in the woods. The body count mounts. It's a fairly basic horror film template. 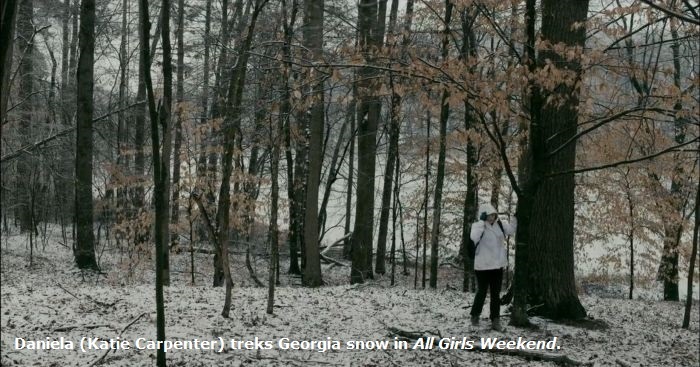 In varying ways, All Girls Weekend resembles The Prey, The Final Terror, and The Blair Witch Project. These films feel the same. Young people enter a pristine wilderness, surrounded by a majestic natural beauty which then turns menacing. The threats differ. Inbred maniacs hacked and slashed the campers in The Prey and The Final Terror. All Girls Weekend lies closer to Blair Witch, where the threat is supernatural. Evil forces prevent the kids from leaving the woods, eventually killing them off. Or maybe not the forest, but the spirit of the forest. This spirit's presence is implied through nothing more complicated (or expensive) than swaying tree branches and blowing leaves, eerie sounds and music, and actors' facial expressions. The only special effect is speeding up the swaying branches and blowing leaves. It's enough to imply the forest spirit, in an admirably budget conscious manner. As All Girls Weekend writer/director Lou Simon explained, "I was watching The Descent for the one millionth time, and I thought how great it would be to make something like it. Obviously their budget was pretty high. I had to come up with a way to do something similar but on a much smaller budget. There are a lot of nods to The Descent in the film, including the name of the abandoned mill in All Girls Weekend." The Descent is set in a cave rather than a forest. Its similarity to All Girls Weekend is in the cast. Both are "all girls" films. "As a woman writer/director, I wanted to make a film with an all-female cast," said Simon. "I wanted to make a film where the women are real people, and exist other than to talk about or relate to men. I would have loved to have an all-female crew, but time and budget made that impossible." Five girls comprise the cast. Four friends from high school and a newcomer who's invited along by Nancy (Jamie Bernadette). Ironically, Nancy is more the odd girl out than the newcomer. Nancy is surly and disdainful of her friends. She not only smokes -- something done mostly by villains in modern movies -- but her smoking frequently compels her to leave the group, to spare them from her second-hand smoke. Thus does Nancy self-segregate herself from the group. Her attitude and behavior also singles her out as a probable final survivor. "I wanted [Nancy] to go through a complete transformation," said Simon. "You're supposed to not like her at the beginning, and when things get tough and she steps up, you see that she is not what she appeared to be at the beginning." While All Girls Weekend has its merits, its casting and characters failed to elicit the responses from me that Simon intended. I liked Nancy from the start -- and she remained the only girl that I liked. Nancy is serious and grounded -- a woman among girls -- unlike her chatterbox friends, who seem not to have matured since high school. That there are no boys around fails to elevate their level of discourse, which is vapid and shallow. I can understand why Nancy is always seeking excuses to step away for a smoke. For those who care about such things, the cast is diverse. They appear to be two whites, an Asian, a black, a latina. 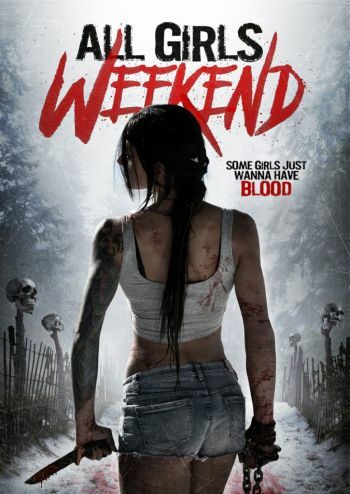 Even so, All Girls Weekend is a traditional horror film, with the usual character dynamics. Shallow young people enter the woods. One is bad and bold. One is good and brave. Most are frivolous and cowardly. The latter die first. The bad and the good face off. While the characters are mostly uninteresting, the cinematography is polished and professional, the Georgia wilderness beautiful to behold. (Even if Nancy is bored by so many trees; she's a city girl at heart.) Crowning its beauty is a serendipitous snowfall. "Nobody was more surprised that it snowed than us," said Simon. "We had pushed back the shoot dates so it'll be later in the winter and warmer. Instead, the day we began filming, the weather forecast came back with an unexpected snow storm for the next day. We almost cancelled filming altogether, but we decided to see if we could make it work. Somehow we persevered through it. They're actually my favorite scenes in the film." Although the snow arrived on the second day of filming, Simon wisely shot the final scenes during the snow, then the earlier scenes, by which time the snow had melted. Thus, in the story, the girls enter a dry forest. The snow storm strikes toward the end -- the ideal moment for snow, storywise. As events darken and the survivors still can't escape the woods, the forest adds cold and snow to the girls' misery. Storywise, All Girls Weekend is unexceptional horror, sometimes entertaining, sometimes boring chit-chat. One girl knows about the evil forest spirit. She invites her friends for a hike, intending them to be the next victims. The forest takes its toll, first through natural means -- accidents, bear attacks, etc. The girls discover the remains of previous victims. As time shortens, the forest takes shortcuts, manifesting its conscious presence more explicitly. There is some gore, but not at grindhouse levels. The film was shot with a Red Epic camera and edited on Adobe Premiere. 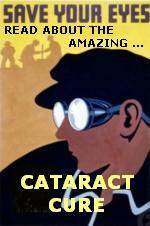 It was financed by "private investors."